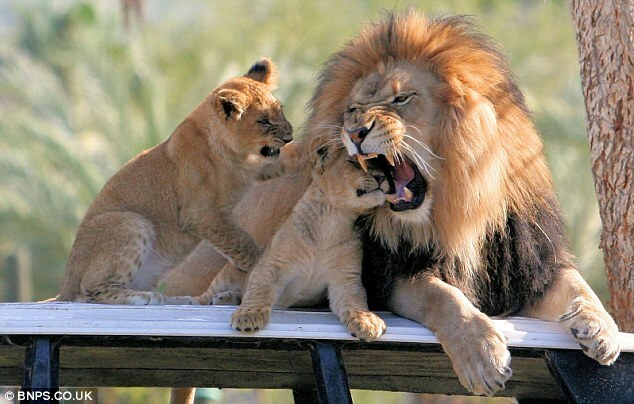 This lion cub has clearly bitten off more than he can chew after annoying his dad once too often. The adult male finally lost patience with his attention-seeking son after the fun-loving cub spent hours tugging on his mane and chewing his fur. The young lion scrambled all over the adult male, trying to entice him to play as he lay sleepily on a car roof. Eventually he snapped, whipping his head around with teeth bared before sinking his fangs into the cub's head. But far from being subdued by his father's show of discipline, the cub looked up at him adoringly before running off to play. The incredible moment was captured on camera by amateur photographer Karl Drilling at San Diego Wild Animal Park. 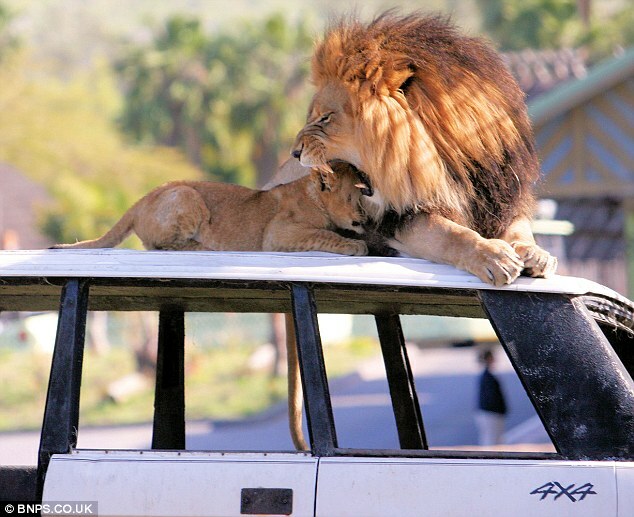 Mr Drilling, 46, from California, said: 'The lions were relaxing on top of the car, which they absolutely love to do. 'The cub had been annoying his dad for ages, tugging and chewing on his mane. 'He just wanted a bit of attention. The cubs can all be pretty rough but they don't know any better. 'The adult male has this incredible patience and is very gentle with them, but this time he sent out a warning shot. 'He turned round and bit him right on the head. I didn't notice how hard it was until I checked my photos afterwards. 'Amazingly, it didn't hurt the cub at all - he didn't even flinch. 'He looked a little bit sorry himself for a second and looked up at his dad sheepishly, but he got straight back into it.